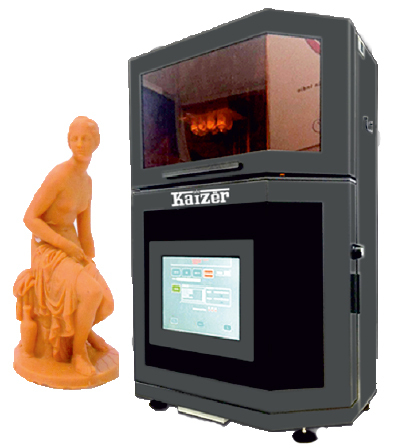 Kaizer 3D Printer is a technology company in the field of generative rapid prototyping and rapid manufacturing systems Kaizer 3D printer Manufactur in INDIA. We bring a new and generative technology to the market that is setting a new benchmark in speed and accuracy. All in all we stand for these core values: Strong customer & partner relationship, highest efficiency based on production quality and cost-per-part! All in all we stand for these core values: Strong customer & partner relationship, highest efficiency based on production quality and costper- part! easy maintenance Using Digital Light Procesing technology (DLP) System with ultra-HD resolution to manufacture 3D models for, direct Casting and general purpose Products. 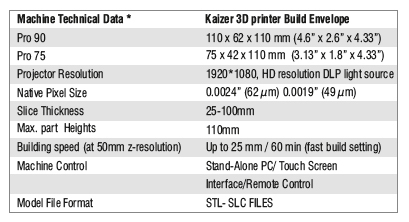 Kaizer 3D printer faster than comparable systems, building 25mm per hour at 50μm zresolution with "Fast Build" setting. Unmatched accuracy with smallest native voxel size and finest z-resolution! the model is gently handled in the fastest way possible. Perfectly suited for filigree items with highest demandson surface Quality. Fully automation Self Cellibration System. Per hour as 0.0056" (50um) voxel thickness. Material Changover can be done quickly easily. Intensity Calibration Sensor, Calibration plate and tools. KD-1 - mould making (silicon & high temperature rubber) general purpose resins & direct Castable resin.